I probably shouldn't admit this but I think tattoos are kind of, a little bit...hot. 'Cause you know what's even hotter? Grammatical mastery. Yeah, give me a guy who can use all the elements of language properly, who can create complex sentences that still parse correctly, who can toss in a ten-dollar word offhandedly, and I'm smitten. Oh, god. I'm horrified by those tattoos. 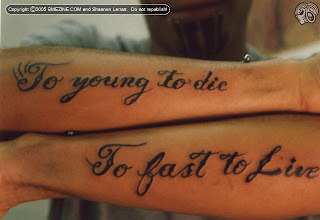 I've got a couple tattoos, but as yet none with text -- and that pic is exactly why. I'd love to get a snippet of prose ("Down these mean streets..."? Ah, who knows.) but the more text, the more chances to mess up. Incidentally, I commented on the disparate nature of his two careers, and he said he felt pretty diverse until he found out the Portland Sea Dog's mascot was also an undertaker. I aint for sure I knowed what you was meaning by that and I don't have no tattoos but I might could get some or one if it would help my chances but I knowed you married lady? Yeah, L.G.C., now I'm gonna waste the rest of the day thinking up the perfect tattoo for you :) - - this is just too easy, with your fondness for all those lovely symbols and artifacts!! Tattoos are for other people. Not me. It hurts to get them!